Greg is explaining why he has not yet responded to his cervical screening recall letter. I worry the waiting room could be full of women and I’d feel out of place. Also, I’m worried that the nurse would ask, you know, ‘awkward’ questions. The questions he is referring to are not the routine queries expected at cervical screening appointments, but something Greg fears, as a man, he may be asked. ‘Why are you here?’ being the most obvious one. Greg is 32 and when I ask him how he would describe his identity, he suggests a handful of terms such as 'trans man, trans male or trans masculine'. To him, the qualifier of ‘trans’ is used in this case as we are discussing cervical screening, but in most other occasions he tells me, he would just describe himself as a ‘man’. The term ‘trans’ is an umbrella term used to describe someone who identifies with a gender different to the one they were given at birth. People may use many terms to describe themselves, including ‘transgender’, ‘non-binary’ or a number of other terms. It is important to note that ‘trans’ is an adjective and many who I spoke to would describe themselves primarily as ‘men’. Some non-binary people describe themselves as trans while other do not. Previously, most information about cervical screenings was targeted towards women, so for anyone with a cervix who does not fit into this category, there can be a feeling of being out of place. It’s a very female-centred space. I recognise that most people who have a cervix are female, but the language isn’t very inclusive of those of us who aren’t. It makes me feel very excluded. The assumption that everyone who is eligible for cervical screening will be female can create issues. Greg shows me his recall letter, his title is listed as ‘Ms’. He explains that he has not asked for a change of gender on NHS systems yet, in part because he fears he will be dropped from the recall list for cervical screening. If you are a trans man aged 25 to 64 who has registered with a GP as male, you won’t be invited for cervical screening. Trans people can ask to change their gender on the NHS systems, but it’s really important they have a conversation with their GP to ensure cervical screening continues to be offered by the practice. 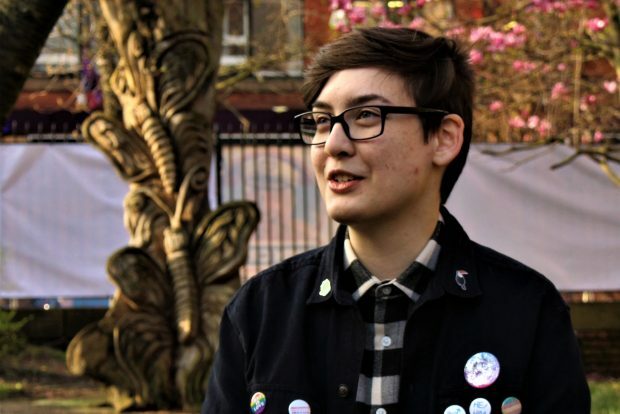 Nick, who has affirmed his gender on the NHS system, describes his initial anxiety over booking his cervical screening appointment. I felt like if I phoned to book an appointment for a screening they’d assume I was winding them up. I had to go into the practice, not knowing what to expect from the receptionist and with other people potentially overhearing. In this case, Nick's experience was broadly positive. In the end it was a non-event. The receptionist didn’t even look like she needed to think twice. She just did it like it was any other appointment. This highlights a key point. When it comes to offering patient centred care, trans people want to be treated like any other patient. Being called ‘mister’ or using male pronouns would help me feel normal and not call out the experience as being anything unusual. Being aware that not everyone accessing cervical screening will be female is an important point for any healthcare professionals involved in the process. Angie highlights the importance of inclusive language in communications. For example, Cancer Research UK and Jo’s Trust have recently broadened their language around screening to include ‘women and anyone with a cervix’. And PHE Screening is adding a line to the new cervical screening leaflets to make the same point. Many I spoke to express a preference for accessing screening through GP practices rather than the ‘well woman clinics’ which used to be common but which Angie pointed out were 'female-centred spaces'. I’d much rather go for a screening at my GPs. They know me there and I wouldn’t feel like I’m going into a woman specific space. To be inclusive of trans and non-binary people, NHS screening staff need to be aware that while most patients accessing cervical screening will be women, that is no reason to ignore those who are not. It’s great that the national cervical screening team in Public Health England (PHE) has already been working on a number of these issues. The important thing is for trans men and health professionals to work together to break down barriers. There are resources NHS colleagues can access around trans awareness, such as the Pride in Practice programme by the LGBT Foundation. Resources such as these can be useful for health professionals to better understand some of the things that can put people off screening and how they can be addressed. In addition, the cervical screening programme is developing new invitations, results letters and leaflets which will be more inclusive. These will be available later in the year. We’re really pleased to see Fox Fisher has created a brilliant new video of their experience of going to cervical screening which highlights some of the issues experienced by trans people. In May 2018, PHE Screening’s inequalities strategy was launched to highlight its commitment to reduce inequalities in access to screening services and address barriers that prevent people and communities from engaging with or participating in screening. This post is the second in a series about cancer screening in LGBT communities. Coming soon is a blog about work being carried out by the LGBT Foundation and PHE on inclusion of LGBT communities. Further information on cancer screening for trans people can be found in PHE’s guide to NHS Screening Programmes for trans people.